How can you go wrong? 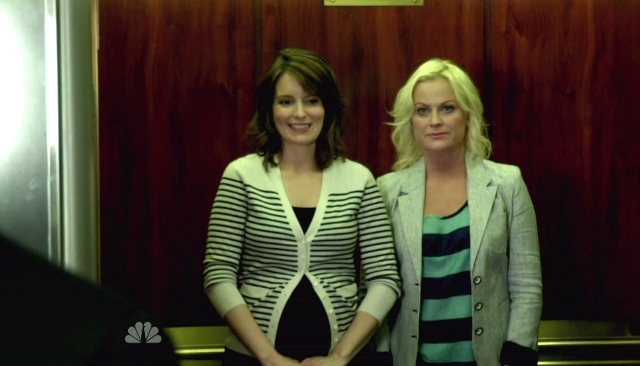 I literally do not know anyone who was not delighted with the news that Poehler and Feyare going to host the often-completely-sleepy Golden Globe awards, although I’m sure you’re out there, whispering behind your hand and hoping you don’t get caught. Stay inside. Let’s not play around here. This is a big damn deal. It’s not just about the fact that there are women hosting, in a show that is usually hosted by men or sometimes by a disembodied voice (“Women hosting” is both completely overdue – like, in a way that is almost embarrassing - and kind of an afterthought), it’s the fact that these are not just the funniest women on TV today, they just might be two of the most consistently funny people – except for Louis C.K., whom I’m sure will get multiple shout-outs and acknowledgements, or would if the Hollywood Foreign Press Association didn’t feel like he was kind of a weirdo. But let’s just confine our joy to the top three reasons this is awesome, shall we? 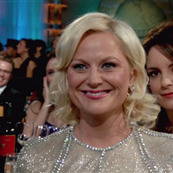 I go back and forth on the whole “Poehler and Fey are besties” thing. On the one hand, I find it pretty condescending to each of them, and to our own intelligence. 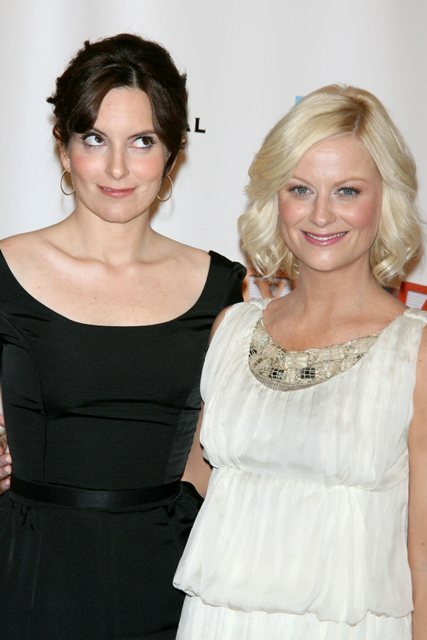 Neither of them has a closer friend who’s, say, not also a comedic actress? They have to be Best Friends with each other only? But then I think they’re enormously busy, and have two kids apiece, and why wouldn’t one of your closest friends be someone who understands exactly what it’s like to be the face of a Thursday-night network TV show? Either way, they’re for-real friends, they have a for-real great time with one another, and isn’t this the dream? To be able to do it together? Legions of tween girls are going to text one another all “when we grow up we can host the Golden Globes together!” and I am cynical and I am hard-hearted and all, but isn’t that a way more laudable fantasy – even if it never comes to pass – than “when I grow up I can blackmail Justin Bieber by pretending I’m pregnant with his baby”? Two girls doing it together – we could do way worse as an example for our little girls. Remember when Ricky Gervais made those dark, well-deserved digs on the Golden Globes broadcast and then everyone laughed their asses off in the ballroom? You might not, because that’s not what happened. Some of his jokes were basically met by boos, and he had to sort of smile condescendingly in order to recover, which put him off-balance. But that won’t happen here, because the easiest way to get out of a sticky situation is to have your cohost make fun of you before anyone else can. This would have been the case with Anne Hathaway and James Franco if she had felt like she could go off-script and mock him a little rather than just mugging and pretending like it wasn’t happening. What I love about these two above all – the reason the “best friend” label doesn’t feel as icky as it should – is how they are absof*ckinglutely equals. They are balanced in talent and demeanor. They can hold their own with one another, and – and! They’re generous. 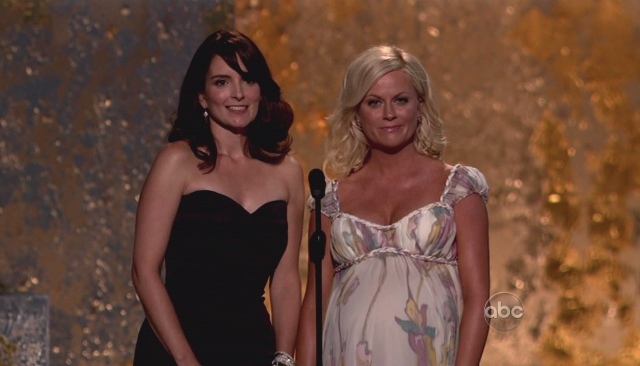 Check out the clip below from the 2008 Emmys – it’s gotten more play since this announcement: Poehler is the clear comic voice, while Fey is the straight woman. 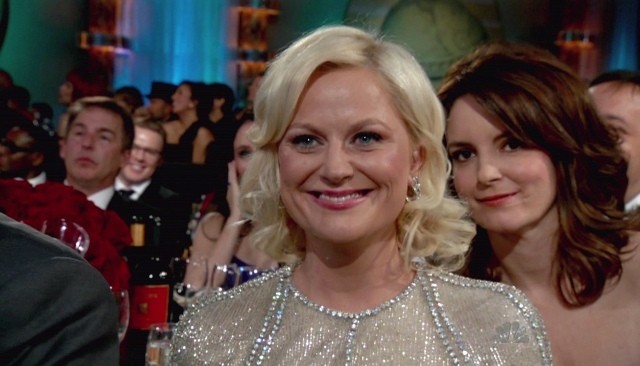 But Tina photobombed Amy at the Globes last year …. 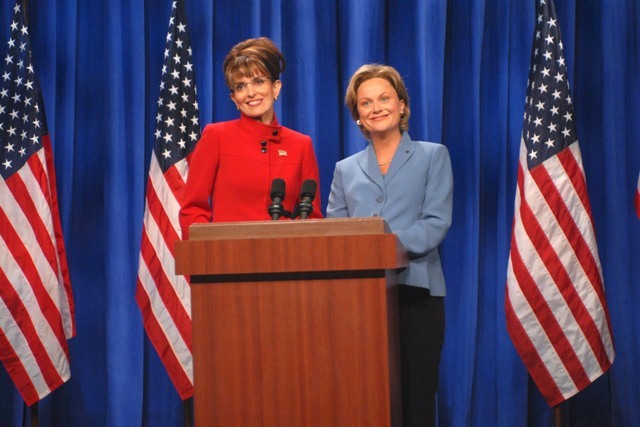 (actually, upon reflection, that photobomb may have been this inspiration for this hosting gig)…and got every single laugh in their Palin/Clinton sketches on SNL. They’re both secure enough in their funny that they can share the laughs. Which is when the magic happens.